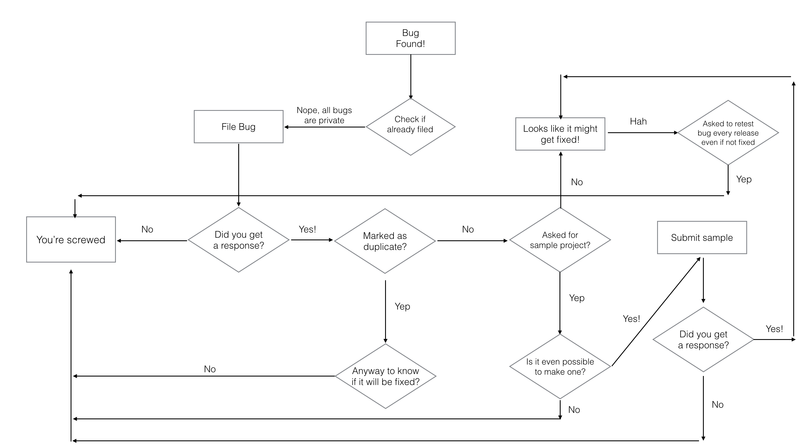 Every month or so in the Apple Developer community, it seems we debate the process of filing bugs. Does Apple care? Do the bugs go anywhere? Does the system work? Is it possible to do better? 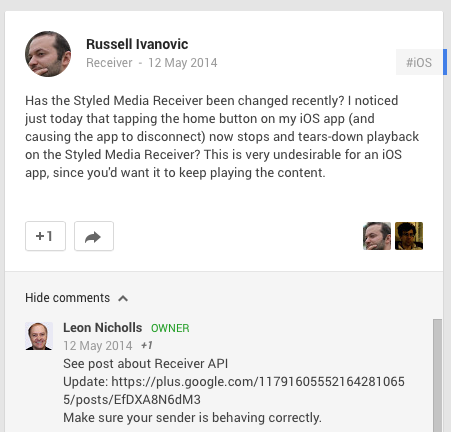 I had a response from a Google Engineer within the hour, pointing me to the post about there being a recent update. I read that, and then decided to file a bug about it. The bug was fixed that day, and Google rolled out a fix for it into production. My bug can be found here: https://code.google.com/p/google-cast-sdk/issues/detail?id=265. So is there another way to do bug tracking that is better? I’d say yes, with a certainty. There really is one fundamental thing that needs to change, in order for the whole thing to change. It’s rather simple, but are you ready for it? Make a new Bug Tracker where all bugs are public. If ‘public’ means you need to log in with a developer account that’s ok. The point is that once bugs are searchable everything gets easier. When I come across a bug I can search for it in the bug tracker. If it exists, I can instantly see if there are any workarounds, and if not when it might be fixed. Ideally I could up-vote or star that bug as well, to indicate I’m having the same issue. If the bug doesn’t exist, then I know I need to take the time to write a really detailed bug report so that others who come across it with the same problem can attach themselves to it. This would offload some of the curation work to developers as well, something that Stack Overflow has proven that we love to do, and are good at. So what are the downsides of this approach? Firstly the most obvious criticism is that some things are under NDA or have to be private. That’s easy, allow private bugs and attachments. 99.9% of the time my bugs don’t need to be hidden from the world so there’s no reason to obsess over this part. The other massive downside for Apple is it makes their action (or lack thereof) open, and visible to the entire world. If there are 60,000 bugs that haven’t been touched by an Apple Engineer then we all know. Desirable for us, but I can understand how that’s a scary thought for them. I could go on about employing technical Developer Relations people instead of marketing ones, about being more open, about setting up communities. But really if Apple could do this one thing…most of our problems would be solved. Or you know, we could keep going with the approach in this flow-chart I knocked up.